What to do with kitchen walls? Most often, walls in the kitchen are blanketed with cabinets, top to bottom, making this a moot question. But open walls are nice, even if it's just a partial open wall. The answer then is varied. Some homeowners add stone accent walls, as shown here. 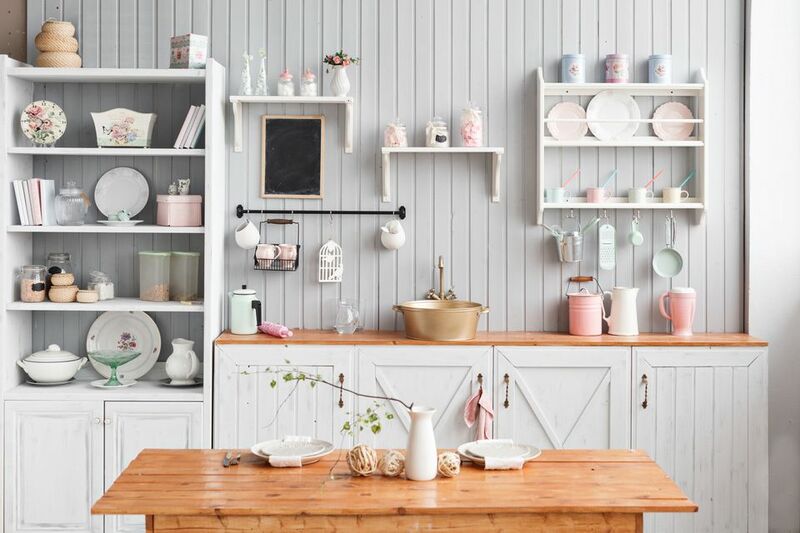 Other people like open walls with spare shelving that show off not just walls but attractive china collections and other dining items. On those cabinet-heavy walls with just a strip of bare space, tiled backsplash works great. If you like stone but don't want the work involved with masonry, faux stone walls made of polystyrene provide the right look. Stone works well in kitchens because it conveys timeless solidity. Barring the addition of a real stone oven, what can you do? Manufactured stone veneer works great in kitchens as an accent wall like the one shown here, from Cultured Stone. Accent walls should be the first thing you see when entering the kitchen and are usually of a bolder color or texture than the other walls. Here's an idea for a kitchen wall from designer paint maker, Ralph Lauren Home. It's a Spartan, elegant design employing open shelving, spare white matching stoneware, and a vibrant color from Ralph Lauren Paint called Monticello Yellow, described by the designer's site as a "brilliant marigold yellow, an egg-yolk hue..."
Walls often present a problem for homeowners remodeling their kitchen. Bare, open walls are great, but unless you have an excessively large kitchen, open walls also mean less storage space. On the other hand, a kitchen whose every wall is crammed with storage space feels cramped and busy. And who really needs a place for every JuiceMaster, egg cooker, and grilled cheese sandwich maker? Designers and DIY home remodelers solve this problem in several ways. Pare down those non-essentials to regain those open walls. Or create a side area, just outside of the kitchen, to store kitchen items you use less than once per week. From tile manufacturer Hakatai, this kitchen wall idea is a backsplash that extends from countertop to the bottom of the cabinets. This lovely, shimmering tile--Pastille and Luster Series, a custom blend--functionally doesn't need to cover that much space. At the least, a few inches are needed for backsplashes, and some countertops eschew even that. But while tiling your backsplash, it often makes sense to cover the whole area to avoid creating a narrow stripe of paint above the tile. Tip: Learn how to find cheap kitchen cabinets. Another stone veneer idea for kitchen walls, this one creating a surround that defines a bar and wine cooler area. Manufactured stone veneer, sometimes called engineered stone, looks and acts like real stone. Contrast this with faux stone panels, also featured in our picture gallery, which are polymer. This great wall idea is from major veneer manufacturer Cultured Stone. Link below. Faux stone: not to be confused with manufactured veneer stone. Faux stone, this example from FauxPanels.com, differs from veneer in two key ways: 1.) It's lighter 2.) It's easier to install since it comes in panels. And since it's not masonry, you don't have to pretend to be a mason. Much easier. Faux panels can even stand up to the rigors inflicted on kitchen walls. This example is called Norwich Colorado, in Stacked Stone pattern and Desert Sand color. A fresh wall idea that's as simple to accomplish as rolling on some paint. This light, airy color is Valspar Sprig of Mint, and it's green in another way, too. This line of paint, Ultra Premium®, is low VOC and low odor. Hands down, our favorite kitchen wall idea in the bunch, this from cabinet manufacturer Merillat. This is a Breland floating shelf. Floating shelves attach to the wall by means of special anchors that are subsequently covered up by the shelf. Thus, it appears to be floating--or at least magically stuck to the wall.